Juneau, Alaska, is known for its gorgeous scenery and remote location. No roads link the city to the mainland, so travelers to and from Juneau must take a boat or a plane. Alaska Seaplanes, a commuter/charter airline serving Southeast Alaska, has a very busy operation based at the Juneau International Airport. In need of a new maintenance hangar and corporate offices, the owners of the airline began planning construction of the new facility. The planning process took almost 3 years, as the owners considered several construction options. With an average annual snowfall of 88 inches (28 inches in January alone), the hangar needed to stand up to heavy snowloads (70 lb/ft2) and high winds. While airplane hangars are commonly constructed out of fabric stretched over a metal frame in milder climates, that combination wasn’t going to fly in Juneau: fabric/metal construction could not stand up to the winter weather, winds, and snowloads typical to the region. The owners investigated all-metal construction, but at over 10,000 square feet, a steel building was cost-prohibitive. 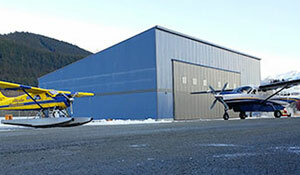 Looking for an option that could handle an Alaskan winter without breaking the bank, the owners turned to Lowpete Construction, Inc., who built the largest wooden frame hangar at Juneau International Airport in 2008. The solution: engineered wood framing. “Engineered wood framing came in at approximately 40 percent less than quoted steel buildings of the same specification,” says Kent Craford, president and co-owner of Alaska Seaplanes. 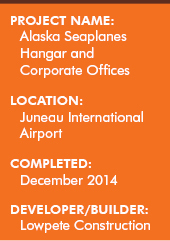 All subcontractors were hired from the Juneau region. 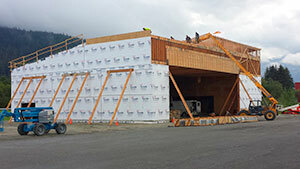 I-joists from APA-member Boise Cascade were used to frame the large office area of the Alaska Seaplanes hangar. A local manufacturer provided the 80-foot-plus trusses. Structural composite lumber wall studs and dimension lumber were used in the all-wood frame, with glulam posts and beams from Boise Cascade for the hangar door. The Schweiss bi-fold hangar door had to be welded together on site, as it was too large to ship to Alaska in one piece. The hangar was sheathed in OSB from APA-member Ainsworth (now Norbord), sided and roofed in metal, and uses radiant in-floor heat in the hangar slab.